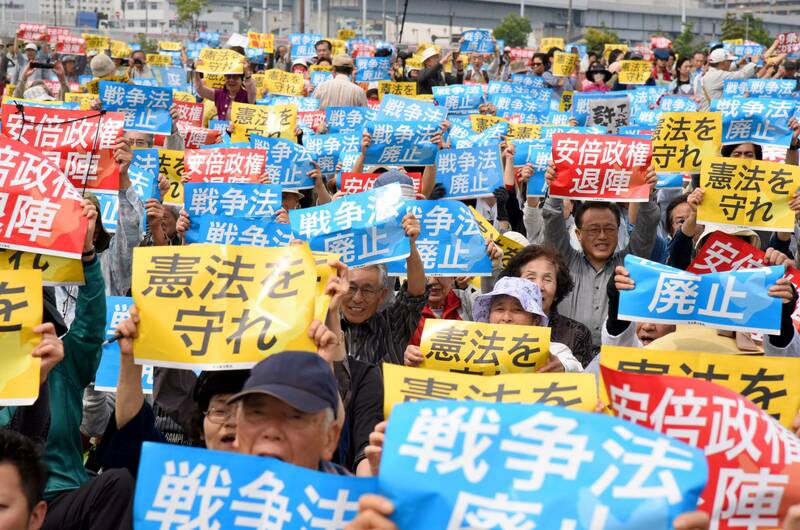 Marking the 69th anniversary of the postwar pacifist Constitution, supporters and opponents of constitutional revision held rallies in Tokyo on Tuesday to speak out on their respective causes. Participants were particularly enthusiastic this year as Prime Minister Shinzo Abe’s ruling Liberal Democratic Party gears up for the crucial Upper House election this summer, in which the party hopes to gain momentum for its long-held goal of revising the Constitution. Activists on both sides see the election as the last chance to realize or thwart Abe’s lifelong ambition to rewrite the nation’s supreme law. The LDP, which along with its junior partner Komeito currently occupies a majority of the 242-seat Upper House, is aiming to increase this to more than two-thirds — a prerequisite for launching a national referendum on constitutional reforms. The LDP-Komeito coalition already dominates two-thirds of the 475-seat Lower House. “There is a rise in public calls for amendment,” the LDP said in a statement Tuesday, claiming that the current document was no longer suited to recent social changes and the world’s political environment. “We need to bring the Constitution up to date, and do so with our own hands,” the party said. In a video message to a forum co-organized by Utsukushii Kenpo wo Tsukuru Kokumin no Kai (Citizens’ Group to Create a Beautiful Japanese Constitution) in central Tokyo, Abe renewed his personal resolve to revise the war-renouncing Article 9, in particular voicing dismay at the current Constitution’s lack of mention of the Self-Defense Forces. The group is widely regarded as an affiliated body of Nippon Kaigi (Japan Conference), Japan’s largest citizens’ group advocating nationalistic policies. The forum was chaired by conservative journalist Yoshiko Sakurai, who backed revision amid Japan’s increasing vulnerability to natural disasters and escalating threats from an assertive China. “The current Constitution cannot protect Japanese nationals,” he said. Sakurai decried the national charter’s lack of an “emergency clause,” which would allow the government to declare a state of emergency in the event of natural disasters and other contingencies to facilitate rescue and reconstruction efforts. Also present at the forum, former education minister Hakubun Shimomura said it was not Article 9 alone that protected Japan after the war, but rather the Japan-U.S. alliance and the deterrence provided by the SDF. Public polls, meanwhile, have suggested a majority of voters are opposed to any revision of Article 9. A Kyodo News poll conducted Friday and Saturday showed 56.5 percent of respondents opposed the idea of revising the war-renouncing Constitution under Abe’s stewardship, while one-third, or 33.4 percent, supported it. 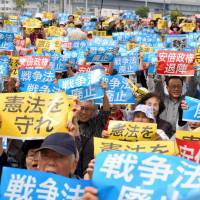 To drum up voter support, three citizens’ groups held a rally at a park in Tokyo’s Ariake district on Tuesday to protest the push for revision, attracting an estimated 50,000 people, according to organizers. This year, the event invited leaders of four opposition parties, including the Democratic Party, the Japanese Communist Party, the Social Democratic Party and Seikatsu no To (People’s Life Party). The politicians reaffirmed their pledge to win the Upper House election and restore democracy and constitutionalism to the country. Democratic Party President Katsuya Okada said Abe had repeatedly alluded to his willingness to alter the war-renouncing Article 9 in the Diet. Underlying such remarks, Okada said, were Abe’s ambitions to remove all of the current restraints imposed on Japan’s right to exercise collective self-defense — or the right to use force to attack a third-party state assaulting an ally country, even though Japan itself is not under attack. Last year, Abe partially removed the self-imposed ban by overturning long-held government constitutional interpretations and revising relevant laws. Although Abe asserts a bolstered Japan-U.S. alliance would help deter foreign attack, protesters say it has an eerie echo of Japan’s past militarism. “We must put a stop to this, no matter what. We will muster what we have to fight our way through the election,” Okada told the crowd. The LDP draft, if realized, would “change the Constitution so that it would control citizens, not the powers that be,” Shii said. “What should be changed is not the Constitution, but the government that makes light of it,” he added.